This may seem like a very easy thing to know (the name pretty much says everything), but why take any chances? When we talk about the lunch box, we do know it’s related to food and the lunch kit (aka “lunch pail”) stores your food so that you may take it everywhere you go. The food container concept does come from way back in time, but it was only in the early 20th century when people started to use some tobacco tins to take their meals along. Then it was the time of the lithographed images on metal and by that moment, the lunch box pretty much became a symbol for youth and an impressive marketable product as well. As for the materials (which are a bit more important than the funny pictures), lunch boxes today are made with plastic and present foam insulation, whereas the interior is made with aluminum/vinyl. This is why the modern lunch boxed maintain their temperature so much better. At the same time, though, they are not as rigid nor protective as they used to be. However, it’s more important for your sandwitch to be fresh, right? You don’t need to worry much about your health when it comes to the use of a lunch box. there were some health concerns 15 years ago when it came out to the public that some vinyl lunch boxes presented high levels of lead. They were redrawn from the shelves though and everybody went back to using the popular lunch boxes again. We all know that sending your kids to school with their lunch may be a challenge, which is why the market gives us all sorts of tools to succeed. 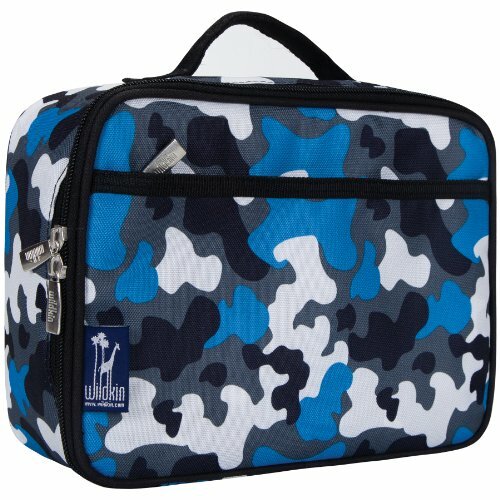 One of these tools is the Blue Camo Lunch Box that comes in so many cute, funny colors and combination patterns that it’s almost impossible not to find at least one that your kid is going to love. The minute your kid decide on the model, don’t waste any more time and get the matching backpack. You do win all the way with this one! However, it’s more than fun and funny colors for the lunch box and the more you use it, the more you realize that you got a long lasting, quite sturdy lunch box. The fabric takes the intense use rather well and may get your kid through quite some lunches. Don’t worry about your kid’s health as the lunch box is made of PVC and it’s entirely BPA and phthalate free. The lunch box is insulated and keeps your kid’s snacks nice and fresh for quite some time. 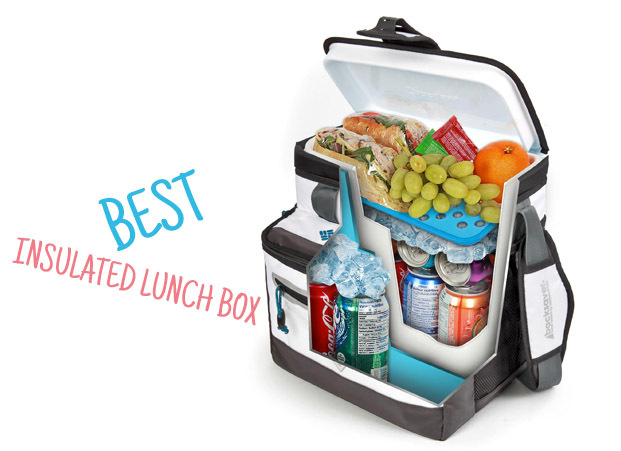 It has enough space for ice, snacks and you may basically fit everything your kid needs for lunch. The zippered front pocket increases even more the storage space. The lunch box is easy to use and to clean, by wiping. 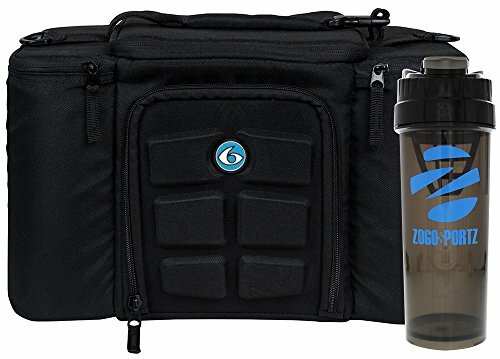 It holds up pretty well and its inner tabs keep safe the water bottles and the ice packs. The inner mesh pouch is great for the fragile snacks. The lunch box has a sturdy construction and looks great for kids. It has a compact shape so it stores easy. It’s a great choice for kids aged from 3 to 15. Despite the minor cons, for the fun look and amazing reliability, the lunch box is a sure buy anytime. 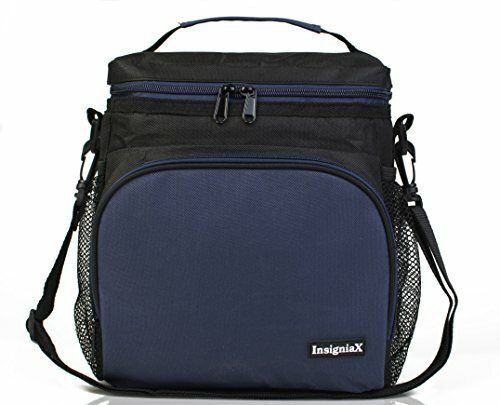 One thing you can’t complain about when you talk about the Insulated Lunch Bag: InsigniaX Adult Lunch Box is its durability. The lunch box is made with long lasting 600D polyester, which means the lunch, is in for the long run. Along with the durable polyester comes the 5mmPE foam padding that protects your snacks or fragile fruits. 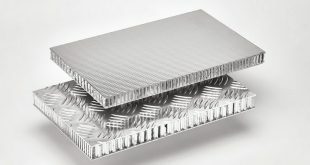 The aluminum insulation keeps your sandwiches and snacks nice and fresh for a long time, even for 9 hours straight when using the ice packs. The lunch box has a well thought design and it gives you deep and spacious interior where you can store all the snacks you need for lunch. If that space isn’t enough for you, you may also use the two side mesh pockets and the front pocket for your cutlery or other flat items. The size is just right and the lunch box has a compact shape, for easier storage. The portability is another thing important to talk about. Not only has the lunch box come with a top handle, but also with a strap. The strap is adjustable and removable, so the lunch box becomes so much more versatile. The 2-way heavy-duty pull zipper is strong and takes the intense use, making it easier for you to zip/unzip the lunch box both ways. The zipper comes with webbing for more strength and to add more space that you can use. The lunch box isn’t just functional, but also nice looking. Take a look at the top handle, for instance, that is nicely colored with black and the color from the front pocket and the remaining part of the cover. The lunch box looks nice altogether. The elastic mesh for the side pockets is great as a way they easily fit drinks or water bottles. The elastic mesh keeps tight and secure any item you’d place. The lunch box is well made and is well priced. No matter the cons, for the good materials and good design, the lunch box is quite an acquisition to make for your daily lunches. The GRUB2GO Bento Box w/ FREE Ideas Guide + Utensils – Leak-proof Lunch Container is sure more than meets, the eye and you need to take a look at a detailed description to better understand us. The box sure stands out from the crowd with its stylish appearance, but we also like it a lot for its versatility and reliability. 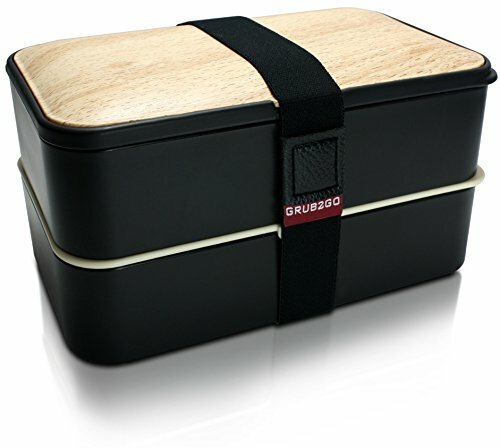 The minimalist design impresses as the lunch box in a black and wood pattern combination and the rubberized outer completes the elegant appearance. Let’s not forget why you’re buying the lunch box and the dual-layer; airtight box keeps your snacks fresh for a good amount of time. 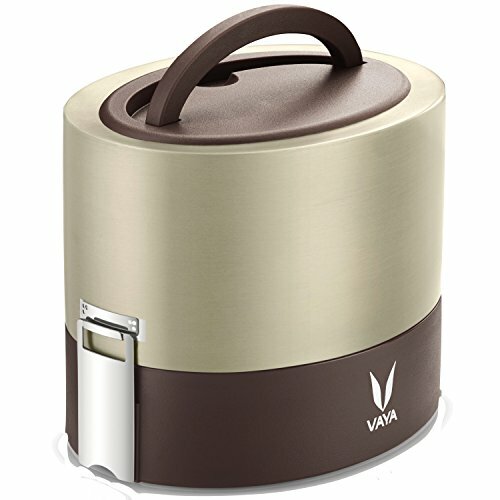 It keeps your food warm for 2 hours, depending on the environment as well. The silicone lids with a built-in vent system makes sure there’s no spilling or leaking. Another great thing about the lunch box is that it comes with free utensils that are made with good quality plastic, having a sturdy feel. The lunch box is made with food-grade materials and is BPA-free. It doesn’t contain any toxic materials and is both dishwasher and microwave safe. You may also safely place it in the freezer as it’s freezer safe as well. The solid build of the lunch box is also worth to mention. 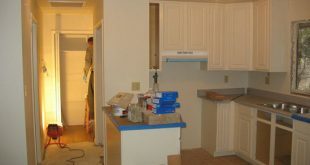 The lid remains tightly in place, minimizing risk for leaking. The lunch box has a stackable design and an elastic band keeps everything in place. The multi-color matter exterior, the silicone lid seal and the stylish look are the strongest features of the lunch box. The minor flaws don’t make us change our mind on this one and whenever you want to try a functional, yet elegant lunch box don’t forget about this one! When you don’t know exactly which size for a lunch box works the best for you, don’t hesitate to get a set than includes two different sized lunch boxes. 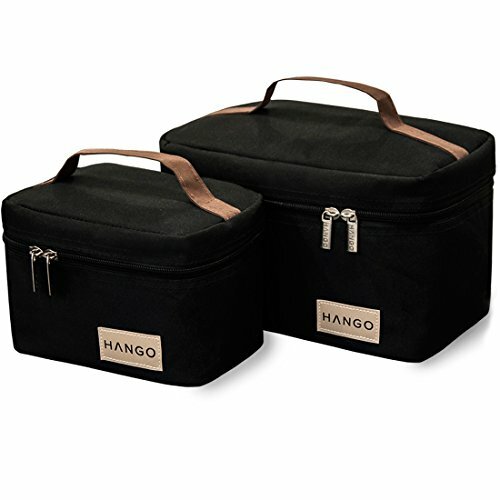 It’s the case of Hango Insulated Lunch Box Cooler Bag that is an amazing option that lets you get just the right size of box on various occasions. You may load full meals, even kits for a nice summer picnic with the big lunch box, whereas the smaller one is a great choice for some fruits, cookies or other snacks. The lunch box is made with high-density polyester 300D, which means it’s quite durable, taking the long time, use. The lunch box looks nice and quite elegant. The brown handle completes with the black of the lunch box and the brown label gives a nice overall appearance. The handle increases the portability of the lunch box. The compact shape of the lunch box makes it easy for you to store and display. The lunch box is lightweight, yet durable. The zippers on the lunch box are made of stainless steel and the box presents an efficient thermal insulation system. The stitching is good and leaves a durability feel. The box includes several pockets so you may organize pretty well your snacks. 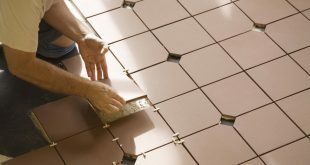 It’s easy to clean it on the inside; you only need to wipe it with a cloth from time to time. The lunch box looks very well made and the set comes in a pretty gift bag, made of 100% cotton. Therefore, it can definitely become a thoughtful gift for your friends. Despite the minor cons, the set is great since it gives you two lunch boxes that differ and may serve you well in so many various situations. 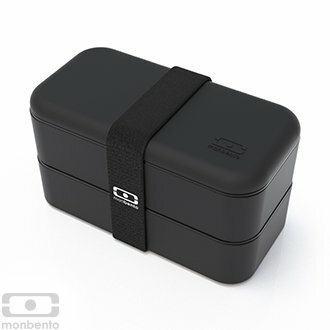 The nice and subtle design of the Monbento MB Original V Black Bento Box recommends it as a good option whenever you’re on a hunt for a versatile lunch box that also looks good. The lunch box includes in fact two containers and you can definitely fit the snacks and food you need for a typical lunch. Two intermediary lids separate the food, the lunch box comes also with one food cap and two food caps, and an elastic band makes sure that everything stays in place for the day. The versatility of the lunch is great and you may easily put it in your bag as it has a compact shape. The lunch box gives you not only nice space to fit your snacks, but also helps you organize it very well. For those of you who pay attention to the diet, the lunch box is great for the portion control also. The internal food cup is adjustable and that’s great as well. The compartments of the lunch box are spacious and the box seals pretty tight. It has a nice touch feel and an elegant appearance. You may also put the lunch box in the microwave when in need. The cleaning is easy to do as the lunch box is dishwasher safe. Don’t worry about your health when using the lunch box as it’s BPA free and food safe. The lunch box presents a solid build and may serve you well for quite some time, taking the intense use. Despite the flaws, we still like the lunch box as it’s dependable, solid and also looks nice. If you’re looking for a lunch box that brings a lot to the table, don’t hesitate and give it a go with the Go Green Lunch Box Set. The set includes a 5-compartment lunch box, an 8oz. beverage bottle and a gel freezer pack that is reusable. No worries about the portability either as they all come in a nice, insulated carrying bag. The lunch box is a great opportunity for you to encourage your kid to eat better at school. The 5-food compartment not only gives a better organization for the snacks, but also offers a more appealing display for the food. The food remains nice and fresh thanks to the Turn’n Lock technology, whereas the silicone bands provide a secure, leak-proof seal for each of the 5 compartments. 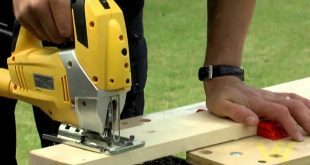 The lunch box presents retention clips that are fast and easy to unfasten. When we look at the carrying bag, we notice it’s insulated and features a cute pocket for the napkins or the eating utensils. The carrying bag is very easy to open/close, as it’s zippered. A great feature on the set is the built-in white board where your kid may doodle or you may leave a cute message for him. The bag also comes with a handy name tag- so many kids forget stuff. The 8oz. stainless steel beverage bottle is very handy at the same time. On the list of cool features, we also notice how the lid and the box may be separated for washing with some warm soapy water. All the items in the set are BPA, lead, leach and phthalate-free, whereas the gel freezer pack is FDA approved. The lunch box has a solid built and is very easy to clean. The latch on top keeps a yoghourt from moving around and the box fits perfectly a typical lunch. It has just the right size for a good fit in any backpack. You may clean the insulated bag with a damp cloth when in need. In order to expand its lifespan, it’s better not to clean the box in the dishwasher. 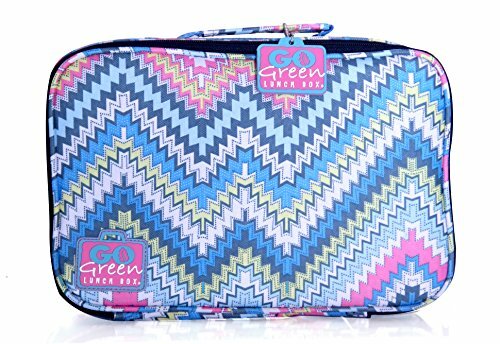 The lunch box looks nice and comes in pretty color combinations and patterns. Despite the flaws, we still consider the set to be a great option for the kids. For those of you who are out of ideas when it comes to developing good healthy habits for your kid at school, a great option to try is the OmieBox Bento Lunch Box with Insulated Thermos for Kids. The lunch box is a thermal insulated bento that offers two temperature zones so you may keep both hot and cold foods. If you want your kid to have a warm meal at lunch, the vacuum insulated thermos food jar ensures good insulation for the hot foods. The jar is made of stainless steel so it takes well the heavy-duty use. Additionally, when you want your kid to have a fresh and cool fruit/vegetable, the double walled, air insulated box is also reliable. The lunch box includes 3 different leak-proof bento compartments that offer a good organization for the snacks. Let’s not to mention they separate very efficiently the food which is far better looking displayed like this. You shouldn’t have any concerns related to the safety of the lunch box as it’s food grade safe and FDA approved for containing only BPA-free materials. The chunky handle makes the lunch box highly portable and your kid doesn’t need a bag for the food. It has a good grip and takes the intense use rather well. The wide and shallow bowl has a great design, as it’s easy to scoop foot out. The insulated bowl is also removable and a removable divider offers even more sections to organize the snacks. You don’t need to do any setup for the lunch box. It has just the right size and presents a solid construction. The lunch box remains a nice, dependable and portable lunch box for the kids as it displays nicely the food and organizes great the snacks. Either you want your lunch to remain cold or warm, a great option to try as lunch box is the Insulated Lunch Box – Stainless Steel Leak-Resistant Food Storage Container. The lunch box is able to keep your food warm or cold for almost 5 hours as it’s vacuum insulated and leak resistant. It’s a great tool to keep your home-cooked meals fresh and warm for a nice lunch every time. You get in fact 2 spill-proof containers that have just the right size for most of our needs when it comes to lunch. You may carry even 4 food varieties with the containers and there’s no need for you to mix them. Each container features a removable partition for you to mix up to 4 food varieties. A positive pressure lid for each container offers dual-level leak protection and the outside shell cover is sealed. 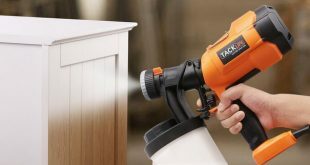 The lateral latches secure the shell, minimizing risk for spilling. You may also use the containers as snack boxes as they keep your snacks fresh for a good time. The lunch box is made with design-of-the-art technology that maintains your food just the way you like it (warm/cold). There’s no smell coming out of the lunch box either. It doesn’t spill and it’s not difficult to fit it in your bag. It’s not difficult to carry it around either as it comes with a handle as well. Let’s not forget about the health issues. Even though the inside of the box is made with stainless steel, the lunch box is BPA-free, non-toxic and respects the safety and health regulations. The lunch box is easy to clean and it’s top-rack dishwasher safe. It’s easy to open and has a sturdy feel to it. Let’s not forget it also looks quite nice. We don’t think the cons are deal breakers and the lunch box is a healthy option to consider, no matter if your food is warm or cold. For a fancy lunch, get a fancy lunch box as the Archer Brighton Sophie Insulated Lunch Box Tote Bag that brings your lunchtime to a completely new level. The lunch bag is not only functional, but also very stylish which makes it a perfect choice for the professional, businesswoman. 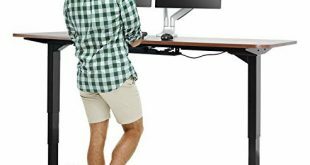 It’s a great option for the office place. The bag is made with water resistant foil that holds temperature so you may have a nice lunch every single time. Your snacks remain cool and fresh for quite some time. 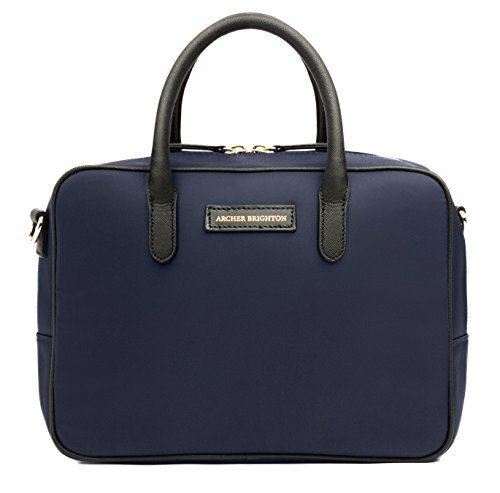 The exterior is made with bilberry nylon and gold-toned hardware, giving the elegant appearance to the bag. Add the leather handle and the leather shoulder strap and you understand the overall all classic vibe. The shoulder strap is adjustable for better fit and also removable, increasing the versatility of the bag. An inside pocket stores the smaller items and the bag offers enough space for your typical lunch. It has a good size and it doesn’t look bulky at all. The stitching is very well made and the materials are high quality. It comes in nice, elegant colors. Nevertheless, whenever in need for an elegant option for your lunch break, spend the extra buck and try the Archer Brighton. If you have to work for long shifts or simply like to be well prepared for the whole day for diet reasons, get one of the 6 Pack Fitness Bag Innovator 300 Black/Neon Blue. The lunch box comes in various sizes and options and you can definitely find the one that fits you the best. The lunch box brings several great things to the table and the adjustable internal shelving (patented) is one to begin with. The shelving fits 3 snap lid containers, which is great for the variety of your snacks. The lunch box presents an entirely insulated interior so your food remains fresh and cold for more than 8 hours. We like a lot the storage options of the lunch box and the two side pockets make room for your water bottles, fruits, utensils or protein holders. The design is well thought out and the 2 gel packs are slotted vertically, maximizing the space for your food. 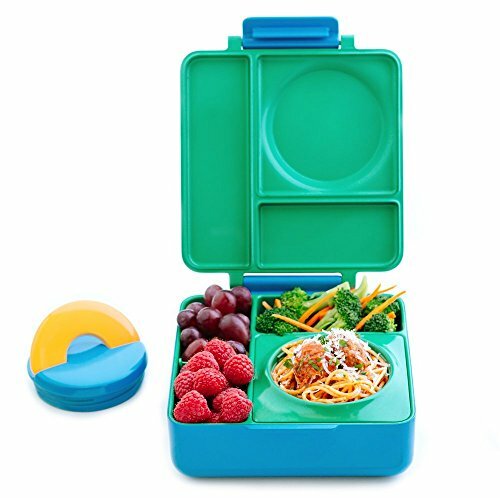 The lunch box comes with 3 snap lid containers that are safe as they are BPA/PVC free. Dishwasher safe and microwaveable, the containers are easy to take care of and to use. The ergonomic shoulder strap increases the portability of the lunch box and makes it easy to carry it around. The lunch box comes in much cool color combination so it’s not difficult to find one that you like best. The strong build and the good, tough material (600D polyester) make the lunch bag a dependable option, able to take the long run. Its sporty appearance woks great for the customer that is always on the move. No matter the cons, for the amazing built and design, the lunch box is a great option for the active customer.